Whenever I think about SD figure, I would think of Gundam. It is unusual to see some SD robot from Macross and this look cute! 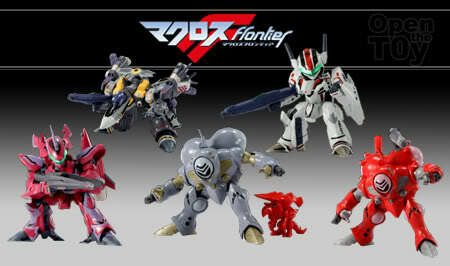 These set is from Banpresto. The set consist of VF-25F Alto, V25S Ozma, VF-27 Brera, Queadluun-Rea Klan Klan, and Queadluun-Rea. Each of them are 3.75 inches tall. Ha! Ha! Must also collect money!! !